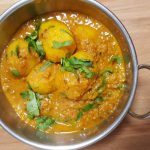 Aloo Methi Recipe, an Indian vegetable everyday dish with potatoes, fresh fenugreek leaves and spices. 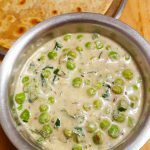 A quick and easy recipe full of flavour and packed with iron naturally present in the fresh fenugreek. Heat up oil in a pan, add the cumin seeds and let them sizzle then add the dried red chilli and fry for a few seconds. Add the onions to the pan and cook until soft then add the ginger and garlic, cook until raw aroma disappears. Mix in the chopped potatoes, fry for 2 minutes then add the spices, turmeric, coriander and red chilli powder. Cover and cook the potatoes until almost cooked, then add the methi mix well and cook until the potatoes are soft. Squeeze lemon juice over the potatoes and serve. Wash the fenugreek leaves, taste, if it's too bitter add salt and keep aside for 20 minutes then squeeze the water, otherwise just chop the leaves directly. 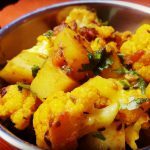 LOOKING FOR OTHER RECIPES USING POTATOES?